raising ebenezers: Czech Course Complete! Yesterday I finished my course! It felt so good to complete it! We got an official certificate (left) and a university t-shirt (top right) that will join my pyjama top pile as it's four sizes too big. We did a final test and I got 89/103 so that was very reassuring! I feel like I'm doing well with the language - aside from things in the class I've been able to have conversations in shops, restaurants etc to help me with everyday life! The course was 100-hours long and it was very tiring (hello 9pm bedtimes!) but it was so good for me! It was even fun to spend time with the lovely people on my course. Of course, I still have a long, long way to go. Every time I feel like I understand how the endings change they change in a completely different way! And we have only touched on the beginnings of four of the seven "cases" in the language. Cases mean something along the line of... the endings of words change depending on whether you are talking about someone, to someone, whether you're in somewhere, or are going to there, or how you're going there.... etc. Czech friends, I'm sorry for how I explained that - like I said, I've still got a long way to go! So, a long way to go but an incredible and exciting start in the language! 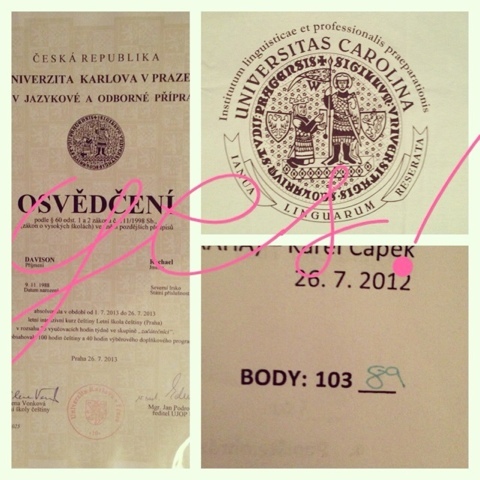 I'm so grateful for this time in Prague and for the decision for me to complete this language course. Thank you all for your prayers for energy and my brain throughout this time!